Classic Movie Man: Dana Andrews Blogathon begins here! Dana Andrews Blogathon begins here! 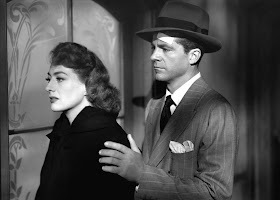 Check out my post below and then click on the links to the posts by other bloggers to get their take on Dana Andrews and his films. Be sure to leave comments on the various posts and let us know what you think! Daisy Kenyon, based on the best-selling novel by Elizabeth Janeway, is one of many films referred to as “women’s pictures” during Hollywood’s Golden Age. In many ways it fits that genre perfectly, especially with Joan Crawford—“an old hand at being emotionally confused” according to The New York Times review—playing the title role. However, in director Otto Preminger’s hands, it’s so much more, with the male protagonists, Henry Fonda and Dana Andrews, also grabbing the spotlight. Of the two, Andrews has the more complex and challenging role. He brings a sense of humanity to a character who may or may not deserve it. Andrews plays prominent attorney, Dan O’Mara who is married to Lucile (Ruth Warrick). They have two daughters Rosmund (Peggy Ann Garner) and Marie (Connie Marshall). O’Mara leads a double life: On the one hand he’s a family man, and on the other he’s a philandering husband carrying on an affair with Daisy (Crawford), a single career woman. The relationship is a strained one primarily because O’Mara refuses to divorce his wife and marry Daisy. Daisy is torn between her love for Dan and her desire for a relationship that doesn’t need to be kept secret. To complicate matters further, Daisy meets World War II veteran, Peter Lapham (Fonda) who immediately proposes marriage. Daisy accepts his proposal and the two are married. But it’s Daisy’s complicated relationship with Dan that is the most intriguing. As the wayward husband, Andrews is charming, lively, and exciting. It’s easy to understand how Daisy might be attracted to Dan. And why else would she put up with all the complications—although they’re starting to wear her down as the movie begins—that he brings with him. Dan is the perfect chameleon. When he is with his two daughters—who adore him—he’s seemingly thoughtful and loving. At the office he is authoritative, but still charming. One look at the adoring expression of his secretary Marsha (Victoria Horne) and you know this is true. Dan’s relationship with Lucile is chilly at best, if not downright cold. One senses from their early interactions that the marriage was probably on the rocks before Dan began his affair with Daisy. Dan’s law partner is Lucile’s father. Did Dan marry Lucile to advance his career? Now that he’s a high-powered New York attorney, is Dan bored with his wife and family? To make things more complicated (and interesting), Dan takes on an unpopular case. He defends a Japanese-American veteran who had his home and property taken from him while he was serving overseas. Dan calls it as he sees it, a clear act of prejudice. An injustice that should not be ignored. Like many characters in Preminger films, no one is all bad. In his review of the film in the Times, Thomas M. Pryor said “As the philandering father, Dana Andrews gives a performance that is full of vitality and technical grace, but it lacks authority, Mr. Andrews, somehow, just doesn’t appear to be the type.” But that’s exactly the point. Andrews’s O’Mara is a man of contradictions. He’s conflicted and extremely unhappy. It’s pretty obvious that Daisy wasn’t his first extramarital affair. On the surface, O’Mara seems to be a man in control, but in his solitary moments, Andrews’s facial expressions reveal Dan’s inner conflict, his sorrow. When he finally leaves his wife and dissolves his partnership, Dan seems happy at last. Lucile, bitter over the way she’s been treated, sues Dan for divorce and sole custody of their daughters and drags Daisy into the suit accusing her of alienation of affections. To spare Daisy from the ugly court proceedings, Dan gives in to Lucile’s demands. He gives up his daughters. In Dan’s mixed up mind, he somehow thinks Daisy will divorce Peter and marry him. That’s one complicated plot line, even for the movies! and check out John Garfield on the left! Even though Dan is pretty much a heel, we sympathize with him. As noted earlier, characters in Preminger films are often neither heroes nor villains, but something in between. Preminger and screenwriter David Hertz give Andrews plenty to work with. When he’s stalking Daisy at her apartment, the lighting is low and shadowy. Small things like taking a swig from a quart of milk while he’s waiting in the hallway outside Daisy’s empty apartment is a great little bit that Andrews pulls off with natural ease. Andrews and Fonda brilliantly underplay the interactions between their characters. They act almost like best friends and fraternity brothers vying for the same girl in college. Preminger has Dan mingle with some real-life New York characters like Walter Winchel, Leonard Lyons, and Damon Runyon at the Stork Club (recreated on a Twentieth Century-Fox sound stage). 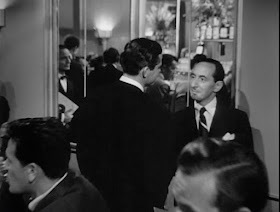 If you look carefully as the camera scans the Stork Club bar, you’ll get a glimpse of John Garfield, who supposedly, was filming Gentleman’s Agreement at the time, and did the cameo as a favor to Preminger. And you’ve got to love the way Andrews calls everyone “Honey Bunch.” Andrews makes it all seem real and plausible—Dan O’Mara knows these folk! Dan is looking pretty grim. The film concludes when the three have a showdown of sorts at Daisy and Peter’s New England cottage. By this time, Daisy has decided that life with Peter may not be as exciting or passionate as it was with Dan, but she has a better chance at happiness with a man like Peter. Dan, not accustomed to losing in court or in love, is devastated. He’s finally made the decision to divorce his wife and the woman he wants doesn’t want him. The picture of Dan in the backseat of the cab as he’s about to leave the cottage is one of deep hurt and despair. He’s given up his marriage, his daughters, his law partnership and he’s left with nothing. He’s a truly broken man. Backstory: According to Andrews’s daughter, Susan, in the documentary Life in the Shadows—The Making of Daisy Kenyon, Andrews only made the film because he knew Fox would sue him for breach of contract if he didn’t. His daughter thought it was a good role for him, but suspects because his character doesn’t get the girl at the end he didn’t want to star in it. Crawford, on loan from Warner Brothers, requested and got both Fonda and Andrews to star opposite her. Obviously too old for the role, Crawford wanted the audience (and studio executives) to believe that she could still play the types of roles that made her a star at M-G-M when she was still in her twenties. Check out the movies playing in Daisy’s neighborhood—the Fox backlot. Mr. Lucky is the main feature starring Cary Grant and Laraine Day. The second feature is The Woman in the Window starring Edward G. Robinson and Joan Bennett, but we only see Robinson’s name on the marquee. Daisy Kenyon opened at the Roxy in New York on Christmas Day 1947. Mr. Lucky was released in 1943 and The Woman in the Window was released in 1944. Both films would have been at least two years old when Daisy Kenyon was released. Neither film is a Fox production. Mr. Lucky and The Woman in the Window were released by RKO, not Fox. One wonders how those two films ended up playing in Daisy’s Greenwich Village neighborhood. Fox has included Daisy Kenyon in its “Film Noir” DVD collection, which is an odd fit considering it doesn’t quite match that genre. The film incorporates some noir techniques like the great shadowy cinematography by award-winning director of photography, Leon Shamroy. Some suspect this technique was used to soften Crawford’s features and make her appear younger than she was; Crawford and Fonda were both 42 years old when the film was released, Andrews, the baby of the group, was 38. Check out the great posts on Dana Andrews below. Click on the respective links to read them. Enjoy! Another Old Movie Blog and its take on Swamp Water (1941). Is this Dana’s first breakout performance? 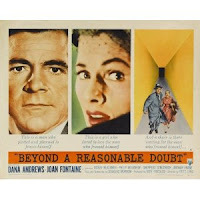 They Don’t Make ’Em Like They Used To takes on Beyond a Reasonable Doubt (1956). Will you have doubts after you read this post? Speakeasy serves up Fallen Angel (1945). Can a fallen angel be redeemed by love? 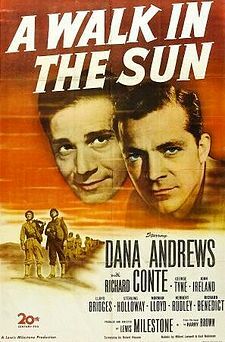 Carl Rollyson, author of the new biography releasing this September, Hollywood Enigma: Dana Andrews gives his short take on A Walk in the Sun (1945). Is it the best World War II film ever made? bettiwettiwoo makes us take another look at Laura (1944), as if you had to twist our arms to do so! Once Upon a Screen reviews The Best Years of Our Lives (1946). Is this Dana’s best film role? Bobby Rivers TV takes a look at the career of Dana Andrews in Overlooked by Oscars: Dana Andrews and shares how Andrews’s performance in The Best Years of Our Lives impacted his life. 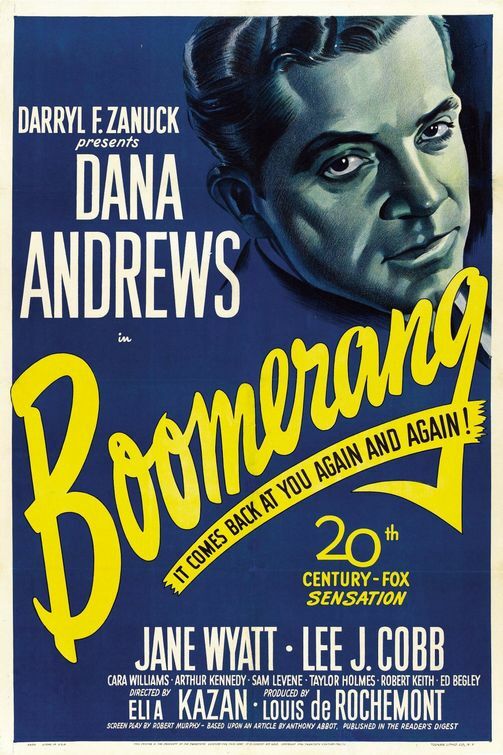 Paula’s Cinema Club examines Boomerang! a film totally dependent on Dana carrying the movie. Does he deliver the goods? The Shades of Black and White blog reviews State Fair. Is this musical version better than the original or the 1962 remake? What Happened to Hollywood takes a look at the gritty Where the Sidewalk Ends. 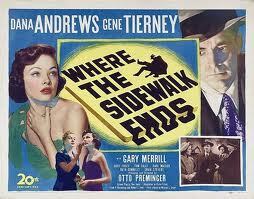 Another great collaboration between Andrews and director Otto Preminger. Cinema_Fanatic pictures Laura, another take on the classic. Is this a fair portrait? Immortal Ephemera shows some mettle with The Purple Heart. 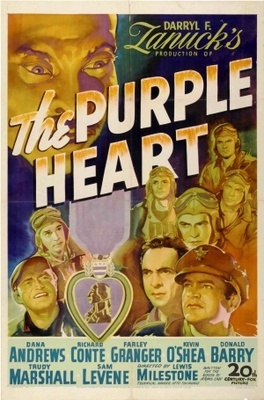 Dana heads a strong cast in this WW II classic. Laura’s Miscellaneous Musings on Wing and a Prayer. Did Dana reach new heights with this role? The Fox legal files suggest something was going on between Dana Andrews and Joan Crawford. I don't mean an affair. Crawford wanted one, but Dana had no romantic interest in her--or in any of his leading ladies, except for Linda Cristal. But Crawford made quite a scene over Dana while also trying to attract Henry Fonda, who also wasn't interested. Fonda and Andrews were a lot alike as actors. Fonda once told Dana's wife that he (Fonda) had gotten some roles that might have gone to Dana, if Dana's drinking hadn't wrecked some opportunities for him. Why is this important? Because of the comment that Fonda and Andrews sometimes act like fraternity brothers in the picture.Their offscreen rapport also translated well on screen. Thanks, Carl. 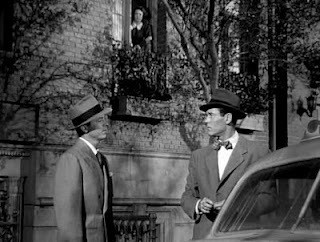 You do get the sense that Henry Fonda and Dana liked each other in the film, if somewhat cautiously since they were rivals. I've heard in real life they got along fine. They probably both complained about Daryl Zanuck together. Yes. Zanuck was no favorite. Fonda saw what a good actor Dana was in The Oxbow Incident. Great post. 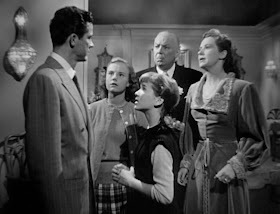 The first blogathon, Dana Andrews post I read and can't believe I've never watched this film with this great cast! Can't wait to see it. Thanks! It's an unusual film that has so much going on. Like many Preminger films it's way ahead of its time. Definitely worth a look. All three stars are great, with Dana a standout, I think. Fallen Angel has become my favorite film. At the time, critics called it sordid. But I think it wears well with time. As good as Dana is, I actually think Alice Faye is the key to the picture's success. The psychology of her charcter is fascinating, and her way of getting Eric Stanton to recognize her as a person and then to love her is extraordinary. Look at the hotel room scene, when she asks him to hand her a towel. She is asserting her identify as a wife. To her the marriage is REAL, and that is what Eric ultimately cannot deny, even though he thought he wanted Stella. Whoops! I have Fallen Angel on the Brain even when we are discussing Daisy Kenyon! Daisy Kenyon was on my list to watch for a long time before I was finally able to do it (I got up at five in the morning to watch it on TCM, but it was worth it) even despite the fact that I do NOT like Joan Crawford. I literally watched this film for Henry and Dana. I thought Dana was a heel until he made those sacrifices, but even when I thought he was a heel, I couldn't help but like him a lot. Dana is magic like that. It is a fun movie to watch. I know you don't like Crawford,but I think she does a good job. She had great costars to play against so I think she was at the top of her game. Thanks for stopping by. Sometimes the behind the scenes stuff is more interesting than the movie, but not in this case. A great post. Interesting mystery about the other movie posters. This is one movie I need to catch up with again -- I'm not sure I've seen it, or at least not seen all of it. It sounds fascinating. I think Andrews was particularly adept at playing complicated characters. Thanks, Jacqueline. It really is an interesting film on a number of levels. The obvious "women's picture" angle is one, but it touches on child abuse, prejudice, and emotional/psychological issues. All three of the main characters are amazingly complicated, but Preminger manages to keep the narrative flowing smoothly and keep your attention to the end. Pretty amazing. Modern filmmakers just don't seem to able to make you care about the characters like the "old masters" like Preminger did. Old master is such a good word for Preminger. I prefer his 40s films as a contract director to his later independently produced pictures. I agree with you. I think Preminger's films at Fox are among his best. Say what you will about the studio system and the moguls like Zanuck, they knew how to make movies that you cared about. Thank you for the link, Stephen, and I'm so glad I could participate. I also just updated my post this morning with a link to Carl's book! I haven't seen DAISY KENYON yet but coincidentally just ordered it at a great price from an Amazon vendor. Your post certainly has me even more interested in seeing it not. Now that I have a computer up and running I'm looking forward to checking out more Andrews blogathon posts over the next couple days! Thanks again for hosting this tribute to one of my favorite actors. So glad you hung in there, Laura. Your post helped round things out. Looking forward to reading everyone's posts a second (or third) time. I've learner so much about my favorote movie star and his films. And I think you'll enjoy Daisy Kenyon. Let me know what you think. First of all, Stephen, thank you for hosting this blogathon. Dana Andrews is SO deserving of being honored and praised, and I count it a privilege to have been a part of this wonderful event. You did an awesome review of Daisy Kenyon. I have only seen that film once, and it was a couple years ago, so I don't remember it all that well. I do recall thinking that it was an odd role for Dana. He is generally an upstanding, honorable kind of guy, and since I have little tolerance for cheating husbands, it was kind of hard seeing him in that kind of role. Your excellent review has made me want to enjoy a re-watch of this film. Patti, you are so welcome and I'm glad you had a good time with the blogathon. I need to see Beyond A Reasonable Doubt. I've never seen it!? Dana Andrews is my favorite movie star and I still haven't seen everything he's done. I was half-joking with Kristina that we need to do a Dana Andrews Blogathon Part 2! There's enough material to do just that. Glad you liked my review of Daisy Kenyon. It's an interesting movie; everyone in it is so complicated and messed up. Dana perhaps more so than Crawford or Fonda's characters, but man they all sure made their lives more difficult than necessary. Still, I find it an extremely watchable film. Patti, I should have noted that I haven't seen Beyond a Reasonable Doubt all the way through. I've read so much about it and seen clips of it, but need to see it from beginning to end and try to ignore all the commentary. Sometimes when you study film too much you overlook the obvious. Great review of an excellent film and performance. As you say, I can see why Daisy would favor Dan over Peter. The character could easily have become a one-note cad, but not with Dana Andrews playing him. Similar to his work in Boomerang! it's the subtleties that distinguish him. Re: Preminger and the studio system...I think the studio system produced so many excellent pictures in general because it gave the artists a structure within which they could excel. Something was lost when that structure went away. Paula, I think you hit the nail on the head with the studio system. The structure was important and the studios worked hard to craft a star's image and find appropriate scripts and properties for them. They also trained them, giving them small roles at first before they launched them as full-fledged stars, carrying a picture. Nice job of this movie - and the blogathon! Andrews hasn't been given the accolades he deserves, in my opinion, and I'm glad to see a blogathon dedicated to him. Glad you enjoyed the blogathon. And as a huge Dana Andrews fan, I couldn't agree with you more. How he was overlooked time and again at Oscar time, we'll never know. But other famous stars like Maureen O'Hara and Ida Lupino never received Oscar nominations either. Stephen-- finally I make my way to where it all began! I left you for last on purpose (ha, "I meant to do that!") so I could say thanks so much for the idea, the invite and the hosting, and for the nice words about my post. you did super and I'm really enjoying ALL the posts. so glad I got to know you via twitter, like a lot of others it's fun to talk old movies and share fun stuff like this, hope you're not too exhausted to do another! re Daisy kenyon, there's that fedorable Dana again! who wore it better? and again Dana's depth and ability to convey a lot of things going on at once was perfectly suited for this movie--another lovable heel. you mentioned that little milk swig moment and it totally reminded me of something I didn't include in my post, how in Fallen Angel there's a moment on the beach where he's gearing up to romance Alice and he does this weird little move jutting out his chin behind her back. amazing teeny tiny gesture. gotta say Joan had great taste, picking Fonda & Andrews! You are so welcome. To quote another great movie line: "This is the beginning of a beautiful friendship!" All the best. Thank you so much for participating! Just when I think I know all there is to know about classic movies, I find out I don't know all that much. This blogathon was proof. Love classic films, huge Dana Andrews fan, but I still learned so much. It was a ton of fun. Thanks again! Great work on this extraordinary and rather neglected Preminger Stephen! I wish I'd found out about this blogathon in time (Andrews has always been a favourite of mine). On the subject of whether Daisy Kenyon is a noir film, I offered a slightly different opinion on my blog a little while back. I'd love to know what you think of that post! Dave, I really enjoyed your post. You have a great, engaging and readable style that I like very much. I tried to leave a comment at your blog under the Daisy Kenyon post. I may have made two comments because I wasn't sure if the first one took. Feel free to keep the best one and delete the other. Dave, please keep in touch. I may do a Dana blogathon part two when the biography is released in September. Drat! I'll try posting it again. 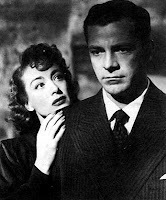 I have always thought Dana Andrews was under-rated, and assume he was often not the first choice for a part he played. I recommend "Mt Foolish Heart" starring Andrews and Susan Hayward, based on a J.D. salingervshort story "Poor Uncle Wiggley", I believe.